Toronto City Council has created a by-law regulating short-term rentals in Toronto effective June 1, 2018. For condo buildings that permit short-term rentals, these regulations restrict investor-owned units from being rented for short-term use. Any individual not legally living in a residential property will now be prohibited from legally renting it for less than 28 consecutive days. This by-law takes precedence over a condo corporation’s governing documents. Individuals owning multiple rental properties will no longer be allowed to rely on short-term rentals for these properties. Condo corporations that prohibit short-term rentals are unaffected by this by-law. Short-term rentals, less than 28 consecutive days, will be permitted in the principal residence of an owner or tenant (called “operators”). Only one principal residence is allowed for each owner or tenant. Short-term rentals of an entire unit will be limited to a maximum of 180 nights per year. Individuals offering short-term rentals will be required to sign up with the City of Toronto’s short-term rental registry. There will be an annual fee of $50. Each registered property will receive a registration number that must appear on advertisements for short-term rental of the property. The short-term rental registry will include name, address, emergency contact, building type and other information pertaining to the short-term rental property. There is a requirement to update the registry with the number of nights per year the unit is rented for short-term stays. 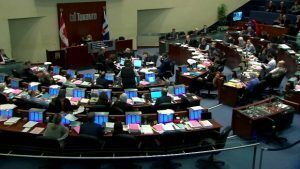 Short-term rental platforms such as Airbnb will require a license from the City of Toronto. There will be an annual fee of $5,000 plus a $1 fee per night booked on that platform. Violations of these rules could result in a fine of up to $100,000. Short-term rentals have a place in the city according to Toronto City Council. Regulations seek to balance residential owner interests with demand for short-term rental accommodation while preserving traditional rental stock. Many of the more flagrant abuses of short-term rentals will hopefully be eliminated. Toronto’s approach to short-term rentals is less aggressive than jurisdictions such as Seattle which has a $14 per night tax. It allows condo corporations the ability to make their own rules regarding short-term rentals. There is protection of housing stock while continuing to allow short-term rentals. Condo corporations and property owners receive protection without impact on lease terms and condo corporation governing documents.